Two quick-footed llamas that dashed in and out of traffic in a Phoenix-area retirement community were captured by authorities Thursday, causing a stir in the streets and on social media. Television footage showed a large, white llama and a smaller, black llama darting through the streets of Sun City during the lunch hour. Cars and golf carts stopped in their tracks because of the wayward livestock. Their televised breakout quickly inspired a Twitter account and several hashtags including #LlamasonTheLoose, #llamadrama and #TEAMLLAMAS. The user tweeted that the idea was inspired by someone starting an account for a bear that caused an online frenzy by running around the Phoenix suburb of Mesa in December. The animal was captured Christmas morning. Social media users shared running commentary and even photos of people gathered around a screen to watch the llama saga unfold. Arizona Sen. John McCain and the Arizona Cardinals got in on the fun. McCain tweeted that he was "glad that #LlamaDrama 2015 has been peacefully resolved!" The Cardinals tweeted that team "agreed to one-year deals with the #llamasontheloose," promising the animals a salary in hay. The llama saga also made actor Lorenzo Lamas a trending topic. Lamas was mentioned in more than 270 tweets in an hour, according to social analytics website Topsy. Some on Twitter joked that they heard the actor was on the loose in Arizona. The animals galloped along the sidewalk, through manicured yards and along street medians. The streets looked more like a rodeo arena as several people tried to lasso both llamas. 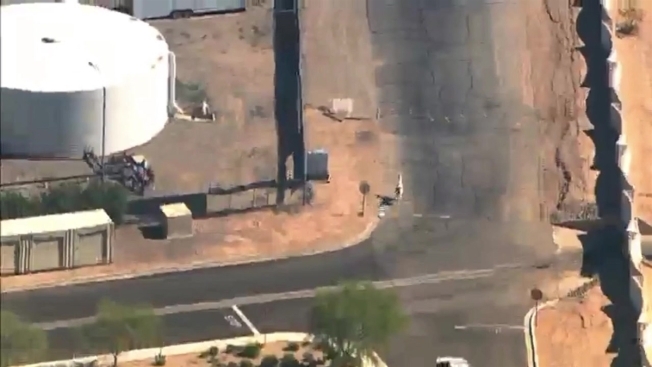 The llamas thwarted numerous attempts by Maricopa County sheriff's deputies and bystanders to round them up before they were roped into custody. The black llama was captured first. The white one was nabbed after two men in the back of a moving pickup truck repeatedly threw out a lasso. It took three men in all to secure the rope. Both animals were escorted to a waiting horse trailer.